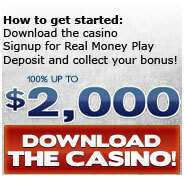 Play Blackjack Online | Super Slots Online Casino! Blackjack is a famous casino game where you can compete against the dealer. The goal of the game is to get cards that are closer to 21 point. Your cards should be better than the dealer`s. Initially the dealer and a player get two cards. One of the dealer`s cards is faced up, so a player can evaluate his or her hand and make a right decision whether to surrender or to bet. Playing Blackjack online at Super Slots has its own peculiarities. This online casino offers the standard betting variants along with insurance bets. The table-layout is pretty nice. You will see a semi-circular table with 5 or 7 playing positions. The best feature of Blackjack at Super Slots online casino is that a player is allowed to play all five playing positions at the table. Imagine you can play simultaneously five hands. One can never find this playing ability at any brick and mortar US casino, so you can enjoy your favorite game without leaving your house! Online casino Super Slots provides its players not only with the best bonuses and payouts among all the casinos that accept USA players but also with special and very interesting strategy articles from Sam Henson. Sam is a gambling veteran and a professional gambler who earns a living playing professionally poker. His advice on blackjack will help new players to become profitable ones at a time of their first deposit!